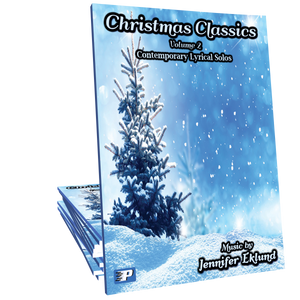 Christmas Classics Volume 1 is a collection of traditional holiday classics arranged in a contemporary lyrical style ideal for intermediates of all ages. Music composed by Jennifer Eklund. I bought this book for a student, but I am enjoying playing through it, too. I think I might keep it for myself! :D Gorgeous arrangements!!! One of my adult students absolutely adores this book! She is enjoying playing it for her family too! I love this holiday book! My intermediate students really enjoy the variety of pieces and arrangements. A studio must have! A teacher friend gave this book to me because she had an extra copy. I love these beautiful arrangements! Lovely for Christmas preludes and offertories, as well enjoyment at home. This is my favorite collection of intermediate Christmas arrangements. The style is so fresh and the pieces are all so enjoyable to play. I would encourage you to add this to your music library!!! Christmas on ice! Jennifer's arrangements are like candy for the fingers which makes them easier play and learn. I was brought back to the piano by these beautiful pieces, each of which is a prayer. Don't miss these! Bought this and Vol 2 for me!~ Love to play out of them during Christmas Time. Beautiful arrangements! I work for a church and have played almost the entire book at one service or another during the Christmas season. Everyone loves the arrangements! A great book to purchase because you can use all the songs, rather than just a few. A lovely book filled with simply amazingly lush Christmas favorites! Along with Volume 2, this is my all time favorite Christmas book to use with students. Every piece is a sure winner! I have often told students that many times I have bought an entire book just for one or two pieces that I like. Every single arrangement in here will be used! Some of them are easier than others which is good. The book is an excellent investment for any musician's library. 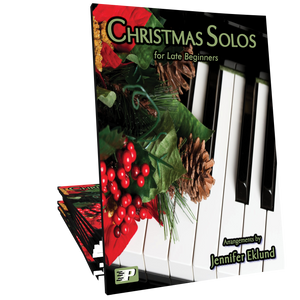 I haven't decided if I can go directly to this book from the "Christmas Solos for Late Beginners," but since the first few in the book seem easier I may give that a try. Beautiful arrangements. Must have for students and teachers. This is my go-to Christmas book. This has become my 'go to' collection for my intermediate students. The arrangements are beautiful, and my students are enjoying them immensely. They are excited to have multiple levels in one book as well. From Silent Night to We Three Kings, each piece is a winner. These arrangements are just beautiful! They are accessible while still maintaining the integrity of the piece, and they are a joy to play. Well Done! Review of Christmas books – I loved using these songs last year as I played for 2 different venues – background Christmas music – they flow so nicely and the melody ALWAYS comes through. 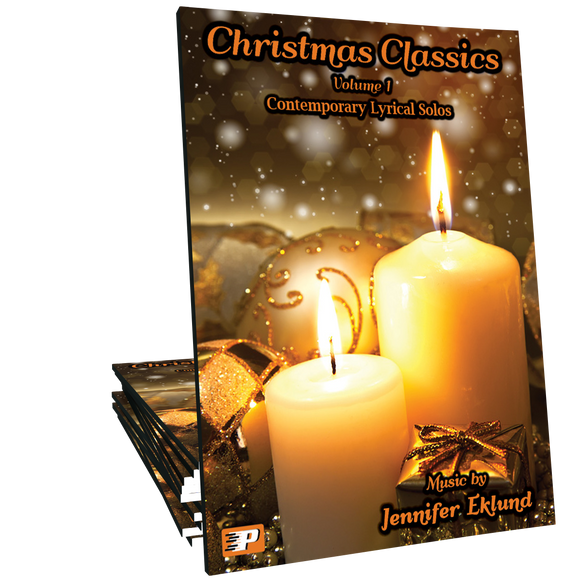 Way to go Jennifer Eklund on producing these wonderful Christmas hymns and carols in this wonderful style. I love Jennifer’s arrangements of the Christmas songs! I will definitely be ordering volume 2. Just beautiful! Beautiful arrangements without taking away from the classics! Thank you, Jennifer for putting this together! The right time for purchasing your books. My students are playing most of these beautiful Christmas pieces on Recorders. It is so on time to come across to your piano arrangements. Have a wonderful Christmas!!! I forgot to say “Thank you” to Joy Morin for letting me know about this wonderful place to visit. Thank you, Joy Morin! I am planning my first Christmas recital. To my early intermediate students, I recommend “Silent night”, “What Child Is”, “Angels We Have Heard on High”, “God Rest Ye Merry Gentlemen”; for the intermediate students – “Joy the World”, “O Little Town Bethlehem”, “Medley: Gesu Bambino”. There are the children’ most favorite “The First Noel”, “We Three Kings”, “Carol of Bells”, “Medley:Jolly St. Nicholas”. The arrangement of lyrics are for everybody Christmas tastes. Thanks. It was so delightful to listen. Thanks to Joy to announce it. This book has wonderful arrangements that students will love. My teens love Jennifer’s music. This book is no exception. It will be great for the yearly studio Christmas Recital. I just finished playing through the Gesu Bambino medley, and I am madly in love with it! It’s satisfying and beautiful and brings out the spirit of the piece without overwhelming the melody. “Jeanette Isabella” is one of my favorite carols, and I am super picky about arrangements and medleys that include it, and I LOVE this one! Thank you! This is a wonderful book! Very nice for sight reading because it is very chord based. Great for intermediate students as well as to keep on your shelf and play for your own enjoyment. Lovely arrangements!! Beautiful arrangements at an early intermediate level. One of my favorite books to play out of for the Holidays! Jennifer most definitely has a gift for arranging music! I have to admit I bought this one for myself. It will be a favorite personally. Great job.